Discussion in 'General Discussion' started by mun35, Nov 12, 2016. 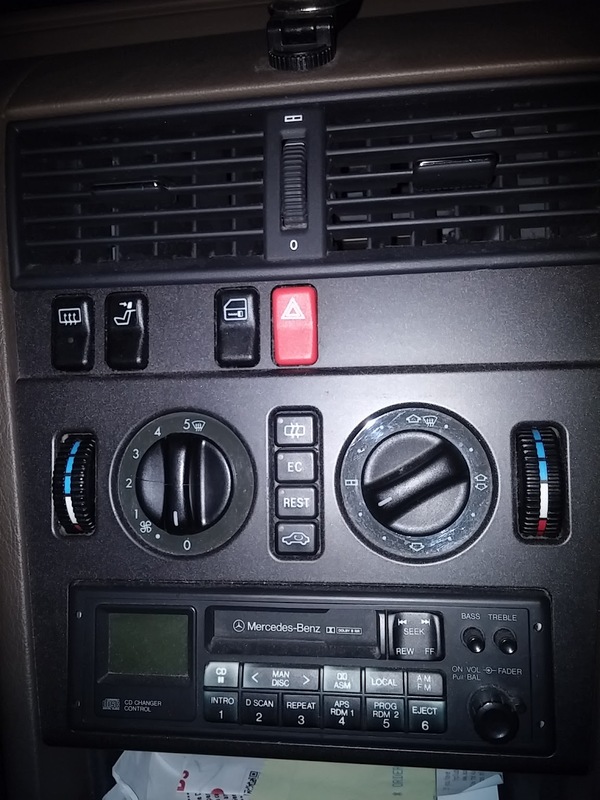 On my dad's W202 C180, the air-con works but no air comes from the centre vents. Does anyone know why this might be the case? Could a fuse be blown or something simple? I believe the centre vents are fresh air only. There used to be air-con air coming from the centre vents. Now the side vents feel much stronger than before and nothing comes through the centre vents. In that case, please disregard. Is the centre vent thumb wheel turned on to open the vent? Yes, the wheel is in the up position and I can see that the vents are open. Could you put up a picture of the area of your dash like the area in picture below? To clarify one thing: it isn't that the centre vents aren't blowing at all, but the airflow is very very weak. It can barely be felt by holding my hand directly in front. I wonder is the right hand air direction dial working, its set at 8 o’clock, any change if you turn it to say 4 o’clock? Are the side vent air flow strong when motor is on full blast at setting 5? It's winter here, how can you tell if the AC works? Are you in the Southern hemisphere or is this another of those wind up threads? I've actually tried all positions - still hardly any coming from the centre. The side vent air flow is strong even at setting 5. At a high setting, e.g., 3+, there is certainly louder sound of airflow behind the centre vents though. By AC, I actually meant to encompass both cool and hot air. Will the recirculate button, with engine running, make any difference… bottom of the four buttons with car image? Was the heater control unit ever removed recently? The recirculate button doesn't seem to work too well - the light doesn't come on straight away, but after 10-20mins. But even when the light comes on, there's still no difference. I've tried other buttons too. No, the control unit was last moved probably 4, 5yrs ago. Lines look normal, if one wasn’t plugged in then it would be hanging loose somewhere, example of another C180 1994 below. 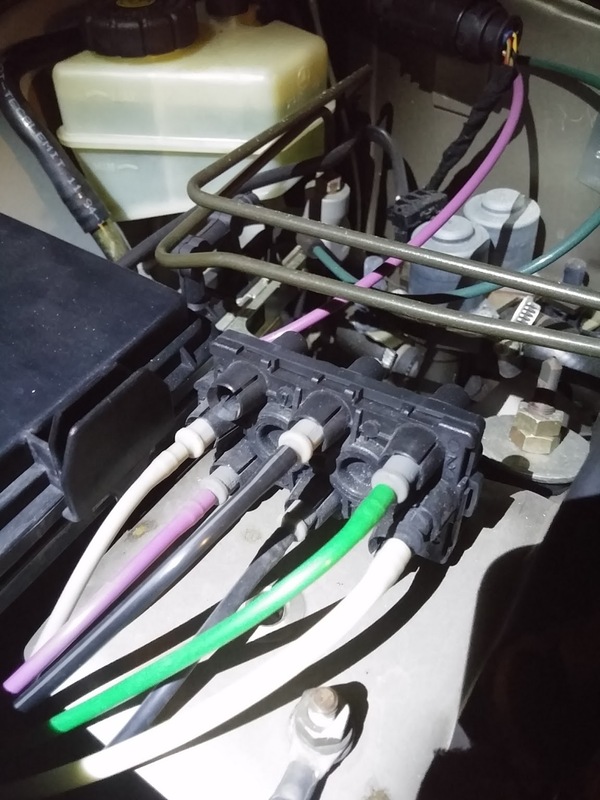 When the heater control unit is removed, sometimes it is not put back properly, sometimes one or both of the 2 pegs on the rear of the unit are not re-inserted correctly into there respective tubes. If that is the case then correcting this issue might have a bearing on your problem, however, both pegs might indeed be in place and aren’t the cause of your fault, so you might be wasting your time checking this out. The only way to check is to remove the unit, slowly, to see if both pegs are indeed in their tubes. When the right dial is turned, the air distribution is altered by the 2 pegs. MY BUDDY HAS THE SAME CAR AS ME I LOOKED AND FOLLOWED WHERE HIS HOSE WENT, THERE IS LIKE A SECTION THAT THE HOSE SLIDES ONTO. IT'S PRETTY MUCH UNDER THOSE SET OF BLACK VALVES ON THE RIGHT SIDE OF YOUR BLOCK. I PUT MY HOSE BACK ON. THE CENTER VENTS BLOW AIR!! Hopefully my situation is as straightforward as his! But what might these "black valves" and the "block" be?